Thanks to the hard-working, exhausted Asbury-Memphis students at Christ United Methodist Church for letting me share with them this morning on my favorite parable. When I was doing what you are doing—reading, studying, discussing God, the Bible, the church — I loved it. When I graduated from Asbury several years ago, I was so tired, but I do miss it. Whether or not you miss this when you finish — that’s more up in the air — you are probably learning about theology—“words about God”—in order to prepare for a ministry in which you will be using “words about God”: in Bible studies, Sunday school lessons, prayer sessions, blog posts, newsletter reflections, Tweets—sermons … What we do in the church is so very often focused on words, thoughts, and ideas. With all the emphasis on words, thoughts, and ideas in ministry and in preparation for ministry, and, with all of ministry and all of our lives ultimately being about the ways that we are faithful to Jesus and his mission in our world—the question should be posed and posed regularly: Are we being faithful to Jesus merely—or even mainly—by saying, or even just hearing, the right words? Now, I love words, thoughts, and ideas. And it works out well that I love words, thoughts, and ideas because they are indeed absolutely essential to the faith in Jesus that we share. It would be nothing without them. And don’t even get Jesus started on words, thoughts, and ideas. He clearly had a fondness for them. He used them well and he used them often. It’s hard to picture Jesus, and impossible to read a Gospel, without everything he taught through his words: questions (more often rhetorical than not), aphorisms, riddles, proclamations, announcements, blessings, curses, parables. To understand and feel the effect of the parable that Jesus tells, it might help us to consider for a moment the parable that Jesus doesn’t tell: He doesn’t tell a parable about a son who says he’ll go and goes, and a son who says he won’t go and doesn’t go. In this parable that Jesus doesn’t tell, you’d still have one son fulfilling the will of the father for him to go and work in the vineyard, and one son who doesn’t. With this parable that he doesn’t tell, Jesus could still make what seems to be his point: that it’s the one who goes to work in the vineyard who does what the father wants. And if you think about it, this parable, if Jesus had told it this way, would be boring. But the parables of Jesus, like Jesus himself, are never boring. They always come with a twist, and they always are meant to have an effect on the hearer. More than just inform, they amuse. They perplex. They surprise. They subvert. They challenge. They indict. Like any metaphor, they “tease the mind into active thought.” They are Jesus’s characteristic manner of teaching; they are his personality, his genius, and his mission wrapped up into stories and similes; they are even the kingdom of God coming in speech. The parables are doing something to the hearer just as much or more than they are meaning something. Meaning can’t be extracted from the prose, or at least it shouldn’t. Lyrics can’t be separated from the music, or at least they shouldn’t. The content can’t be dissected from the form, or at least it shouldn’t. It messes everything up. This means that you really can never successfully explain or teach a parable. In fact, it’s probably best to just read a parable to explain it, and hear a parable to understand it instead of trying to say anything about it. So, future preachers: Don’t ever preach on a parable, ever. Take my advice. So, anyway, back to preaching about our parable: Had Jesus told a parable about a son who says he will go work in the vineyard as his father is asking him to do and he goes and works in the vineyard, and a son who says that he won’t go work in the vineyard as his father is asking him to do and he doesn’t go work in the vineyard, Jesus would still be able to give us a picture of what it meant do the will of the father, and we would (hopefully) be able to determine accurately which one did what the father wanted. But, this would be a rather twistless parable. And so it wouldn’t be much of a parable at all. 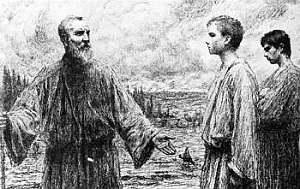 In the parable that Jesus actually tells, however, the twist appears to be that both sons are in the wrong, neither son’s response is perfect, but in the end, one son does the will of the father and one son doesn’t. And, as we submit and do what the parables are designed to make us do, to think and then think about our thinking, we realize that it’s not at all difficult to determine who does the will of the father in this story. The one who works in the vineyard is wait-for-it the one who works in the vineyard. But, to borrow a note from the way parables work themselves as works of art, what is the father’s will—not just in content (which could always change) but in form? In other words, whatever the situation is—whatever the “what” is—what is the “how,” or the way, of doing the father’s will? Is it making the right statement about how they are supposedly going to respond to what he has asked of them? That they will only proclaim or confess properly by hitting all the right bullet points? That they say yes at the right time and about the right things? What is doing the father’s will? With the parable that Jesus tells, as opposed to the parable that Jesus didn’t tell, we get to discover for ourselves that the father’s will has not as much to do with words as much as it has to do with obedience. How the sons answer the father’s command to work in the vineyard doesn’t really count for anything apart from how they were actually going to obey him, or not. The form, the how, of what the father wills is not so much faith as what can be put into words, as it is about faithfulness to the father in relationship. Faith as faithfulness is exactly what is captured in the biblical languages and texts but what has so often been overlooked in our interpretations of them. So much so that Paul and James have been sometimes seen to be at odds with each other, with Paul supposedly speaking of faith as only belief and James speaking of the absolute necessity of faithful deeds. But actually, Paul would agree with James when he says, “If you say to someone in need, go in peace, be warmed, and be filled without giving them the things they need so that they are warmed and filled, then you aren’t doing anything! If you have faith without faithfulness, if you have belief without works, confession without response, it is dead faith” (paraphrased James 2:15-17). Neither son’s response is perfect in this story. It’s not that we should do everything that the first son does. We aren’t being set loose to say and confess and teach and preach whatever we want, as long as the vineyard is being worked in, so to speak. What it points us to is to consider the real purpose of doctrine, theology, teachings – to make you like the first son who says the right thing but doesn’t do the right thing? Or even the one who doesn’t say the right thing but does the right thing? It is much better, we see, to be like the teller of the parable himself (the third son in this situation, if you will) the one whose confession and statement and proclamation of faith not only matches but also intertwines and is rather indistinguishable from his faithfulness. Where our faith, our convictions, what we believe and hold to be true about God in Jesus Christ are indistinguishable from our faithfulness, our relational fidelity to God, it is there that we find ourselves as more than theologians, more than vineyard workers—we find ourselves there as witnesses, those whose entire lives testify to the world God’s coming kingdom of justice, righteousness, and peace as much as they are a part of bringing it in. If parables have a twist, like we’ve seen, and if parables perplex, indict, and challenge — who is that happening to here, when Jesus tells his parable? They are the chief priests and elders of the people. They are the ones who must admit that when it comes down to it, the first son who said he wouldn’t go but did is the one who did the will of the father. Since it becomes clear that Jesus is telling the parable against them, the implication is that as they must admit that the first son is the one who does the will of the father, they must also admit that they are the second son—the one who says the right thing but doesn’t do it. They are the ones who should know better—they are the ones who should be the ones that say they will go and work in the vineyard and actually do it! That’s why, Jesus tells them that the tax collectors and harlots — the ones who are not as likely to say the right thing, to make the right confession — are going into the kingdom before them, because they are doing something that the first son does that the second son doesn’t — Repent. The place where what we believe about God leads us to the fulfillment of his will is always marked by repentance—turning from our own way to the way of God. During this Lenten season we let the words of Jesus spoken over us on Ash Wednesday resound through every moment: “Repent and believe in the good news.” Making a good confession, and doing the will of God.